This is the summary of consumer reviews for Fisher-Price Ocean Wonders Soothe and Glow Seahorse. The BoolPool rating for this product is Excellent, with 4.60 stars, and the price range is $9.99-$16.99. The Ocean Wonders Soothe & Glow Seahorse in pink or blue is the new age 'security blankie' and cuddle companion for your little ones as it lulls them to sleep with soothing melodies and soft glowing light. The mesmerizing light creates a peaceful environment along with the classical instrumental music that the seahorse performs when activated. When gently pressed in the middle, this nighttime buddy plays 8 lullabies along with relaxing ocean sounds that can calm even the most fractious meltdown in minutes. After sleeping with this huggable musical toy, Bach and Beethoven might just be the first two words your baby says! This bedtime favorite is machine washable as the inner mechanics are removable leaving the plush horse to get clean in the washer and dryer. Once the batteries are back in place, the party resumes. But, moms and dads beware! The music can put you to sleep too! The melodies are timed to play for just over five minutes and slowly fade away into the night. Though many parents appreciate the two volume control, a few feel that a longer running time would help; if not they might need to press the horse's tummy a couple more times before their infants reach the Land of Nod. But there are no instructions in the package on how to stop the music, if needed. Upon trial and error, many consumers found that one needs to press and hold the middle to stop the songs. Though priced well within one's reach, this horse might just eat through your wallet, as it consumes batteries like a vacuum cleaner gobbles dirt! Some reviewers also make an alarming observation - while changing the three AA batteries, the chambers give out sparks and smoke and can become a fire hazard. One customer advises everyone to use regular alkaline batteries instead of rechargeable batteries to overcome this issue. 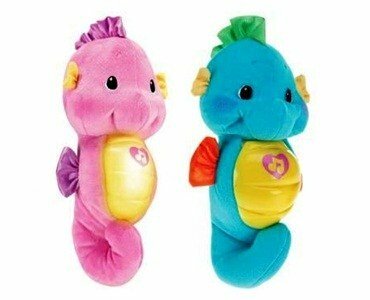 Overall, the Soothe & Glow Seahorse might just become a favorite sleep partner for your kid, and your most important tool for the nighttime routine...as it's perfectly sized for tiny bodies to hug and hold, has silky fins and tail for tactile games and is a melodious, glowing addition to any crib. And here's the deal that might just cinch this for you - this toy can wind down your energizer bunny (2 months or 20? Bring it on!) within minutes! The soft soothing glow and music lull her to sleep. I pushed the belly, and it played soothing music. This one plays very soothing music and has 2 sound levels. This little toy plays music that isn't annoying, soothes my son when he's crying and puts him to sleep when he isn't. It plays music for 5 minutes as well as soothing ocean sounds like waves & bubbles. It plays soothing ocean music for about 5 minutes and its tummy glows. the music plays for a little over 5 minutes, and that always seems to be the perfect amount of time!. The best part is that every song is played twice and it plays slower the second time to really rock that kid to sleep. This little horse plays music for longer intervals which is nice. The music is lovely and so soothing. The music can be played at two different volumes, so that's a nice feature. The music is very nice and soothing, the glow isn't too bright. My son is usually asleep by the time the music ends. I almost returned it because, although it's nice that the music plays for around 5 minutes (we timed 6 1/2 minutes), I didn't want to keep it if there wasn't a way to easily turn off the music without it playing all the way through. I was also glad to read in another review that if you press and hold the belly while the music is playing the music will fade out. The current Gloworms aren't nearly as nice as they used to be - they play loud music and aren't nearly as cute. Secondly, the music and sounds are also much much better - the music is quality and the volume can be adjusted. Of course, when you press the belly of the seahorse, it glows and plays music. We weren't sleeping, he wasn't sleeping. The classical music is soothing and puts her right to sleep. Since she began sleeping in her own bassinet- she goes sound to sleep with the seahorse every single night. lol My baby loves to hold it when he sleeps. She's mesmerized by the light and the music helps calm her down when she's fighting sleep. We brought it up to the hospital when she was born because she'd a hard time sleeping the first night, and she went right to sleep with Seahorse the second night. We spent about two weeks going into his room or letting him sleep in our bed. It puts me to sleep faster! The toy's melodies are so relaxing and calming that'd put to sleep children and grownups. She was having issues sleeping alone in her bed and this's helped immensely! At first we really loved the pink little music seahorse we bought for our little girl but after 7 months we thought it just needed a battery change because it was sounding weird so we changed the battery in it. The battery chamber began smoking and sparking when I changed the batteries for the first time. I'd to change the batteries this morning and the battery compartment smoked and one of the coils turned bright red!. After about two months of use, I'd to replace the batteries in our seahorse. After changing the batteries twice on our first Seahorse, the screws became worn and we couldn't get the battery trap open anymore. It seems on average, I've to replace the waning batteries about every 2 months or so, which seems a little excessive to me. It only gets used 3 times a day, for the 5 minutes it stays on. At 4 months, he started pushing the seahorse belly to turn it on himself. The music and lights turn off after 5 short minutes. Sometimes it plays for a longer time, but even then, my daughter takes longer than 5 minutes to fall asleep! She's now 7 months and loves the soft glowing light and soft music at night. The music is nice because its not very loud like most musical toys are; its soft and soothing. The construction is great, has a nice face, the light gives off a nice soft glo, music is soft and soothing and he loves the feel of the silk and plush body! the light is a soft glowing light that my son just loves to gaze at. I love how soft and soothing the music is and the light is just the right intensity. The belly of the seahorse is also soft and doesn't take much effort for a baby to push to provide a light glow and very soothing music. its soft all over..even the light area. hold down the tummy for a second and the music and light fades off (which is actually a nice feature, baby doesn't notice it turning off).